Very good debut, wonderful voice, great lyrics ... a top singer/songwriter was born. Eigentlich sollte ich nur schon wegen "Foolish Games" und den wunderbaren Erinnerungen an "Who will save your soul" der CD die Maximalnote geben. Andererseits finde ich einige der Stücke doch etwas leicht und fast etwas belanglos, weshalb es insgesamt nur zu einer 5 reicht. Die Musik ist zwar nichts besonderes, doch die Stimme und die Lyrics sind einfach hammergeil!Es gibt in der Musikbranche selten solche gute Songwriter wie Jewel. Freue mich schon auf ihr neues Album "Goodbye alice in Wonderland", dass nach ihren Angaben ihr persönlichstes Album seit Pieces of you ist und die Musik ist auch wieder richtig Jewel-Mässig und nicht mehr so wie ihr letztes Album 0304.
fand ich mal sehr wichtig, mittlerweile ist der Glanz doch etwas ab.. This is one of my favourite albums of all time. Fantastic range of music with radio friendly pop, to more sombre folk sounding songs. She excels with both though, and manages to work both together easily. The singles are true standouts here, but there are also additional standouts, including Adrian, Pieces Of You and Painters. A real emotional effort as well that is easy to get lost in. Definitely in my top five of all time. I must say that this is different to my taste in music, but I like to listen to other music than pop genres. 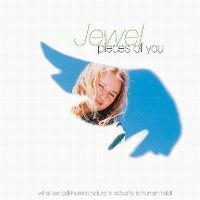 It does show the image of Jewels younger debut with her folky instrumentation very rich and her voice is breathable with pretty much a cute charm. The songs represents with a polarized experiment too. Usually "Adrian", "I'm Sensitive" and "Morning Song" got that simple listen to the lyrics and also its sweet sound. Such a great album and I am very keen to listen again. 5 stars overall.